Claudia was the mother of Linus, who became the second Pope. Tradition has her the daughter of British King Caractacus, who was sent to Rome with his family in chains when he was defeated by Aulus Plautius. 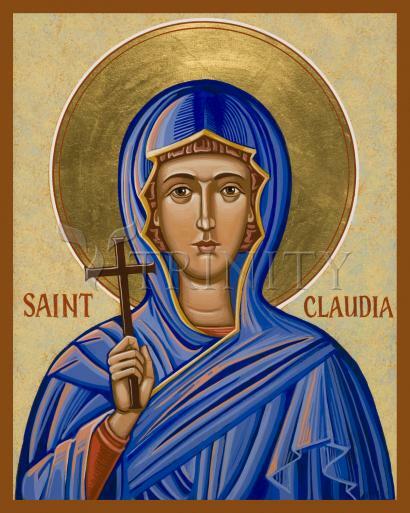 Released by Emperor Claudius, one of his daughters took the name Claudia, remained in Rome, was baptized, and is the Claudia mentioned in St. Paul's second letter to Timothy. Another tradition has her the daughter of Cogidubnus, a British ally of Claudius, who took the Emperor's name. Martial mentions a British lady, Claudia Rufina, and says she was married to his friend Aulus Pudens, a Roman senator. Another tradition has this senator the Pudens also mentioned in St. Paul's second letter to Timothy. Her feast day is August 7.